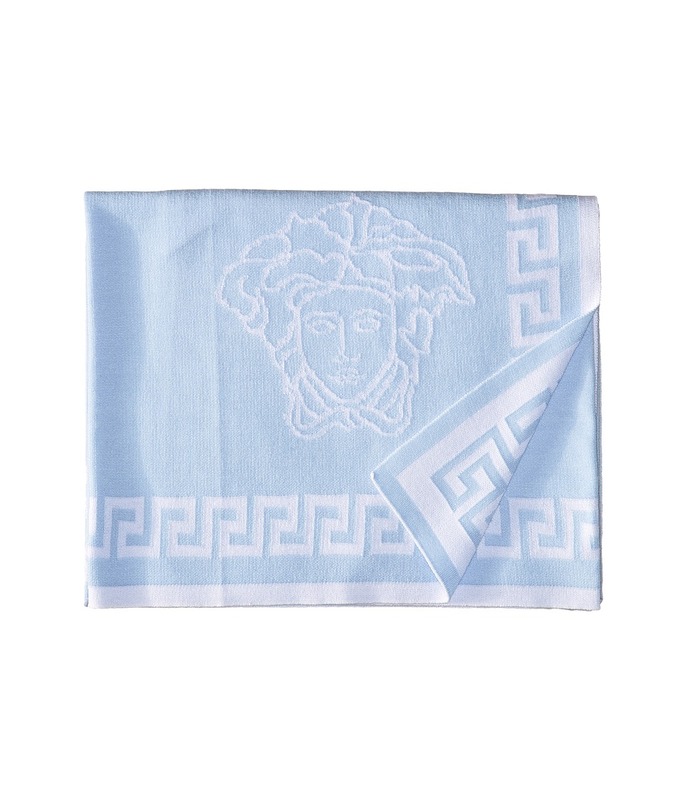 Swaddle them in love with the Versace Kids Knit Medusa Blanket. Medusa logo print throughout. Straight hem. Gift box included. 31 wide x 36 Length. 90 percent cotton, 10 percent viscose. Hand wash cold, dry flat. Made in Italy. This item may ship with an attached security tag. Merchandise returned without the original security tag attached or a damaged tag may not qualify for a refund. 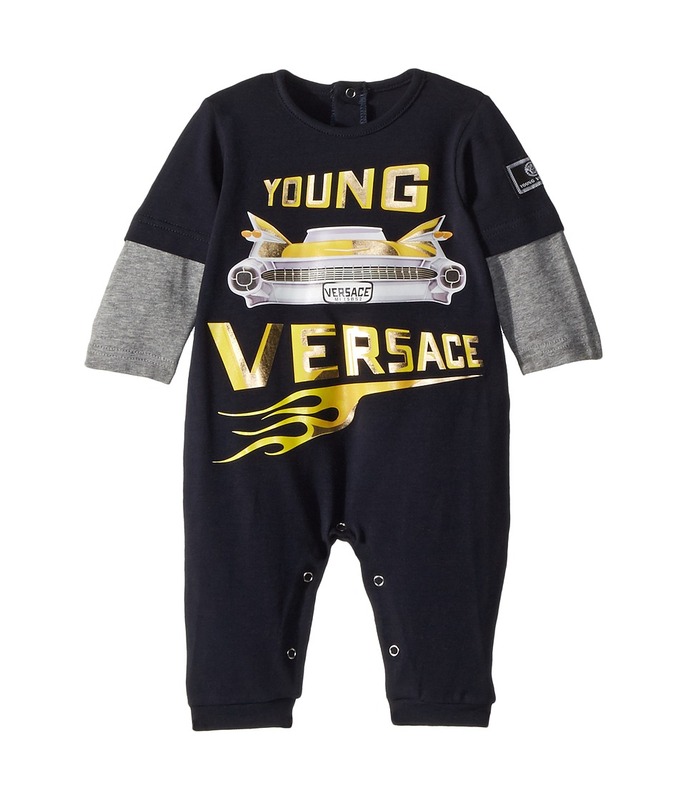 He~ll be ready to ride out in this Versace Kids Romper! Crew neckline. Long, color block sleeves with straight hem. Back and inseam snap placket. Young Versace car graphic along the front. Straight leg opening. 94 percent cotton, 6 percent elastane. Machine wash cold, line dry. Imported. This item may ship with an attached security tag. Merchandise returned without the original security tag attached or a damaged tag may not qualify for a refund. Measurements: Inseam: 5 1 2 in Shoulder to Crotch: 12 in Shoulder to Toe: 16 1 2 in Product measurements were taken using size 1 Month. Please note that measurements may vary by size. 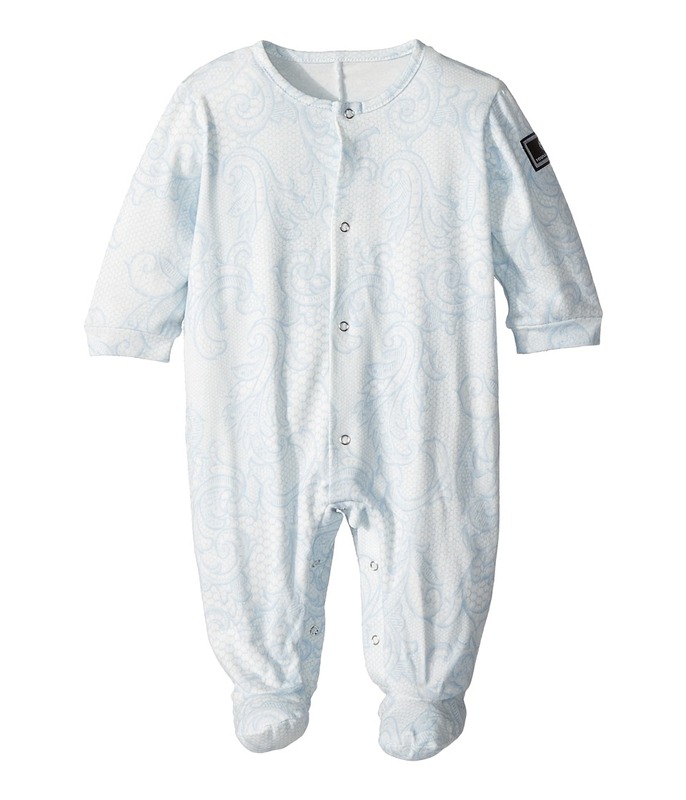 Style meets comfort in this adorable Versace Kids All Over Printed Footie. Crew neck one-piece. Allover paisley print. Long sleeves with banded cuffs. Front and bottom snap closure. 94 percent cotton, 6 percent elastane. Machine wash cold. Imported. This item may ship with an attached security tag. Merchandise returned without the original security tag attached or a damaged tag may not qualify for a refund. Measurements: Inseam: 6 in Shoulder to Crotch: 12 1 2 in Shoulder to Toe: 17 1 2 in Product measurements were taken using size 3 Months. Please note that measurements may vary by size. 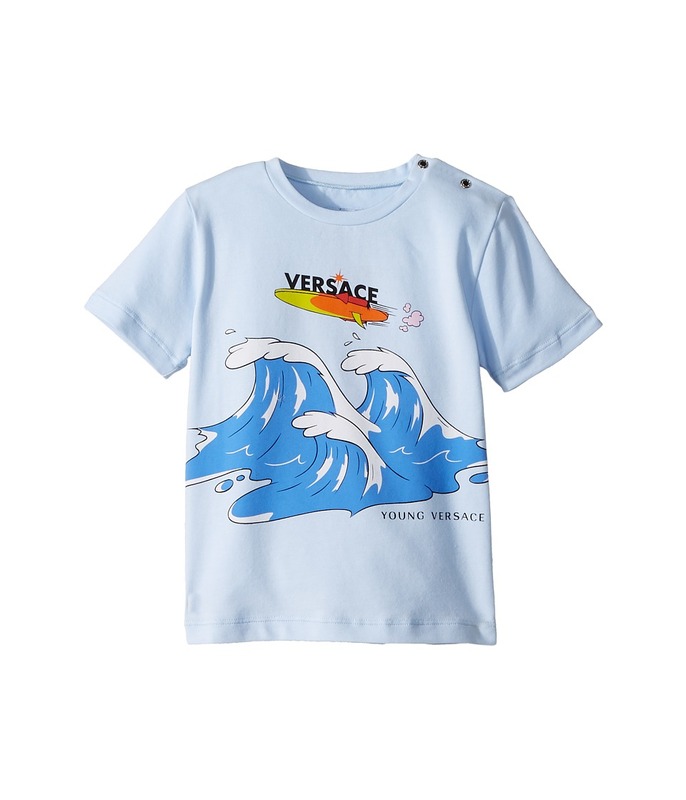 He~ll never wipe out wearing the Versace Kids Short Sleeve Wave Graphic T-Shirt. Crew neck t-shirt. Branded, waves graphic along the front. Short sleeves with straight hem. Left shoulder snap placket. Pull on design. 94 percent cotton, 6 percent elastane. Machine wash cold, tumble dry low. Imported. This item may ship with an attached security tag. Merchandise returned without the original security tag attached or a damaged tag may not qualify for a refund. Measurements: Length: 14 in Product measurements were taken using size 18 months. Please note that measurements may vary by size. 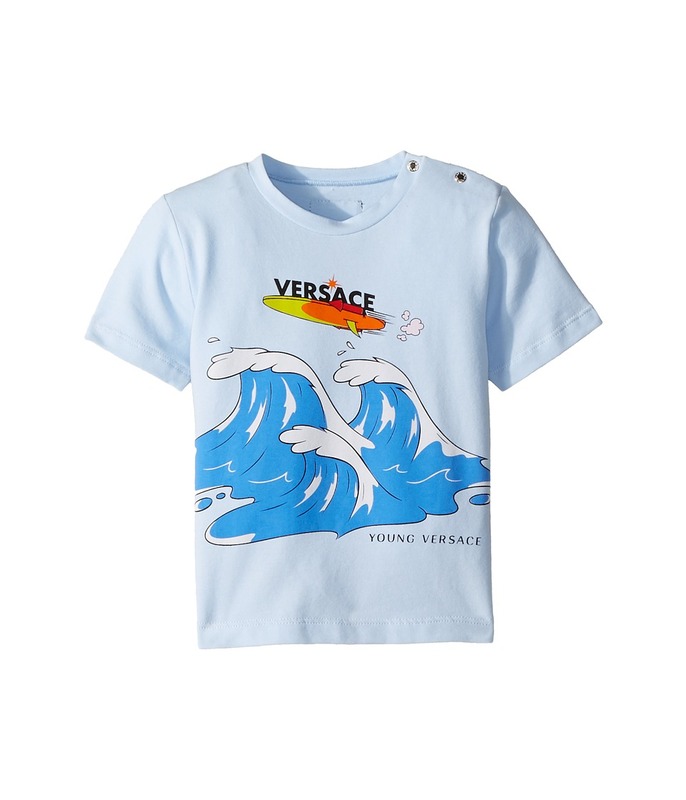 He~ll never wipe out wearing the Versace Kids Short Sleeve Wave Graphic T-Shirt. Crew neck t-shirt. Branded, waves graphic along the front. Short sleeves with straight hem. Left shoulder snap placket. Pull on design. 100 percent cotton. Machine wash cold, tumble dry low. Imported. This item may ship with an attached security tag. Merchandise returned without the original security tag attached or a damaged tag may not qualify for a refund. Measurements: Length: 13 1 2 in Product measurements were taken using size 12 months. Please note that measurements may vary by size. 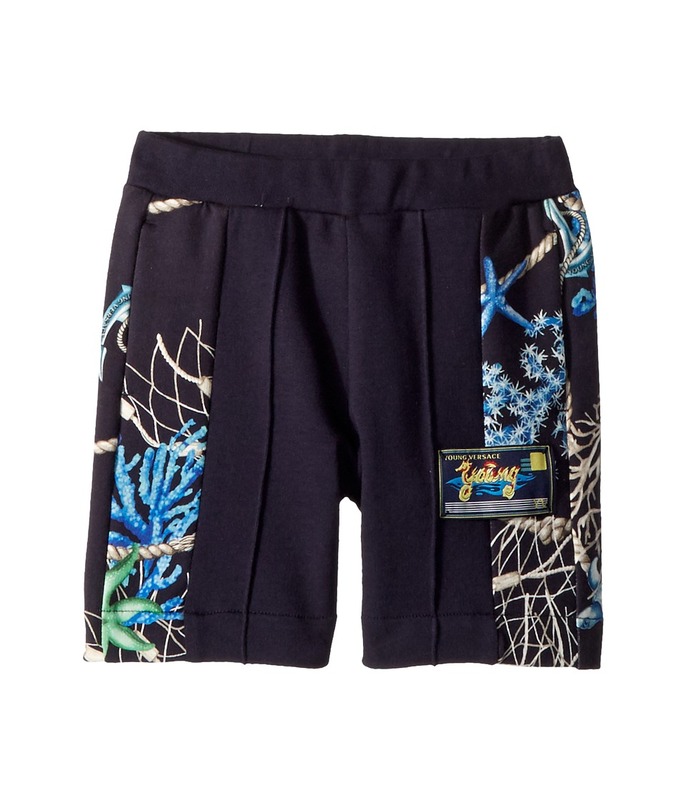 He~ll love these Versace Kids Shorts. Relaxed fit shorts. Stretch waistband. Dual mid-seams along the legs with sea shore print panels along the sides. Brand patch at left leg. Straight hemline. 100 percent cotton. Machine wash cold. Imported. This item may ship with an attached security tag. Merchandise returned without the original security tag attached or a damaged tag may not qualify for a refund. Measurements: Waist Measurement: 22 in Outseam: 13 in Inseam: 4 3 4 in Front Rise: 9 in Back Rise: 10 3 4 in Leg Opening: 15 in Product measurements were taken using size 4A. Please note that measurements may vary by size. 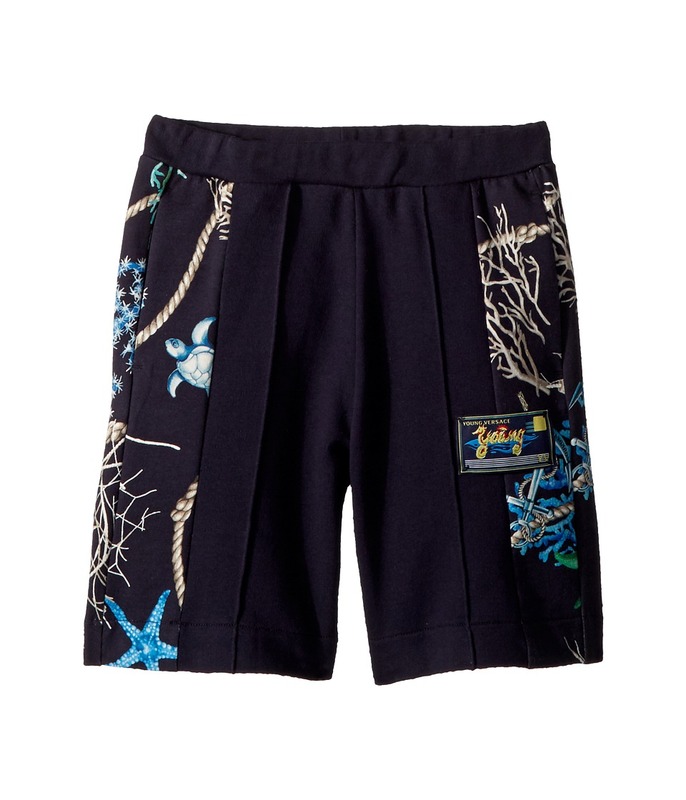 He~ll love these Versace Kids Shorts. Relaxed fit shorts. Stretch waistband. Dual mid-seams along the legs with sea shore print panels along the sides. Brand patch at left leg. Straight hemline. 100 percent cotton. Machine wash cold. Imported. This item may ship with an attached security tag. Merchandise returned without the original security tag attached or a damaged tag may not qualify for a refund. Measurements: Waist Measurement: 25 in Outseam: 16 3 4 in Inseam: 7 1 4 in Front Rise: 10 in Back Rise: 12 3 4 in Leg Opening: 17 in Product measurements were taken using size 8A. Please note that measurements may vary by size. 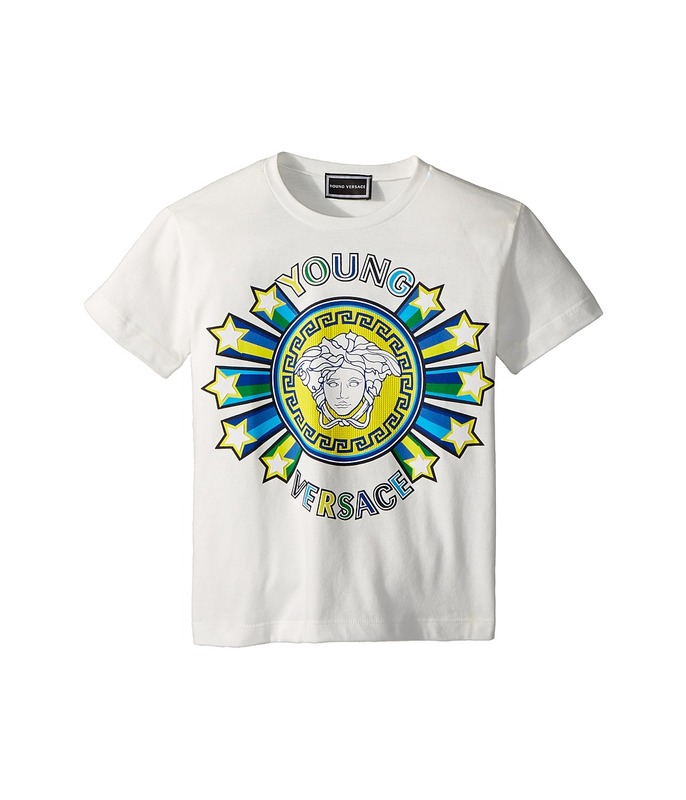 He~s a star in the Versace Kids&amp#8482 Short Sleeve Tee. Jewel neck tee. Relaxed fit. Iconic logo and star graphic at center front. Short sleeves. Straight bottom hem. 100 percent cotton. Hand wash cold. Made in Italy. This item may ship with an attached security tag. Merchandise returned without the original security tag attached or a damaged tag may not qualify for a refund. Measurements: Length: 17 1 2 in Product measurements were taken using size 4T (Toddler). Please note that measurements may vary by size. 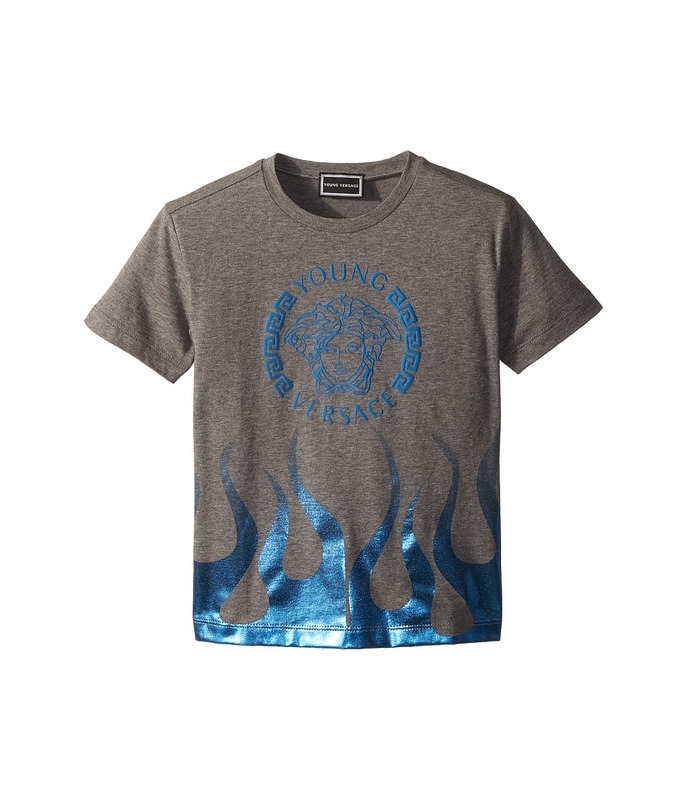 Let him be the heir of his own odyssey wearing the Versace Kids Short Sleeve Medusa Logo T-Shirt. Crew neckline. Short sleeves. Greca and Medusa logo graphic print at front. Pull-on construction. Straight hemline with metallic flame graphic. 100 percent cotton. Machine wash cold, line dry. Made in Italy. This item may ship with an attached security tag. Merchandise returned without the original security tag attached or a damaged tag may not qualify for a refund. Measurements: Length: 18 1 2 in Product measurements were taken using size 6 (Little Kids). Please note that measurements may vary by size.